Standing beside Berkeley Square, the Footman is a grand old pub steeped in London folklore. Now reopened, come and explore our fine range of wines, spirits and ales and sample our exciting seasonal food menu whilst you’re at it. 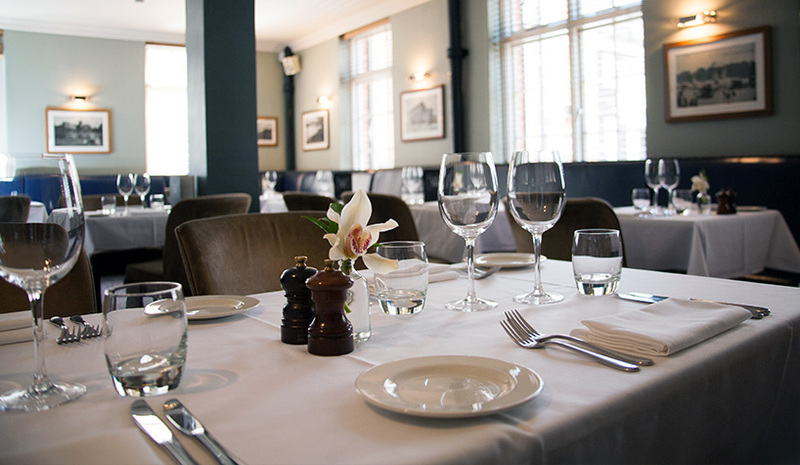 Join us Upstairs at the Footman in our beautiful dining room. You'll find seasonal ingredients treated amazingly well by our kitchen and front of house team. We love our ale at The Footman and we pride ourselves on keeping an excellent selection on rotation. Four hand pulls and eight keg lines showcasing the best craft and international brews. Looking for a private space in Mayfair? We have two don't you know. Click below or give us a call to make an enquiry. One of the oldest pubs in London, the Footman has been in place since 1749. Originally called The Running Horse it was frequented by the footmen who were in service to the households of Mayfair. They would run ahead of their master’s coaches, paying any tolls in advance and clearing a safe passage ahead. As the fashion for footmen dwindled, one bought the pub and named it after himself. Often the source of the best gossip, the pub soon became well known. Formally known as The Only Running Footman we are a three floored pub and dining room still catering for the people of Mayfair and beyond. Traditionally bedecked but with modern stylings, we offer food from our exciting menu from midday Monday to Saturday and also open early for coffee, drinks and business in relaxing surroundings. Come and take a look at our private rooms for hire; perfect for high jinx and all other events, we aim to be a little bit of everything for everyone.